It’s here. It’s there. Watch TV Everywhere. Watch TV Everywhere allows you to watch your favorite programming on your terms–and best of all, it’s free with a Hartelco IPTV subscription! To the right is a list of the channels already on the website with channels being added all the time! Contact our office if you need any help logging into the Watch TV Everywhere (WTVE) webpage. *Your Hartelco TV account number which can be found on your bill and starts with “CV“. *The correct spelling of the last name on the account. The best thing to do is have your latest invoice in hand. Enter the Verification Code provided. Provide an email address. This will become your WatchTV Everywhere username. This can be any valid email address. Nothing. At this time, there is no extra cost for WatchTVEverywhere so feel free to explore. There is nothing available at this site that will result in an extra cost to you (except overage charges from Internet or cellular service). WatchTVEverywhere works anywhere you can receive an Internet signal: inside your house, at the office, shopping mall, hotel, airport, vacation home, etc. Wired connections and in-home Wi-Fi will provide the best quality. Almost all WatchTVEverywhere programs are available on PC, laptop, iPad, iPhone and Android phone. 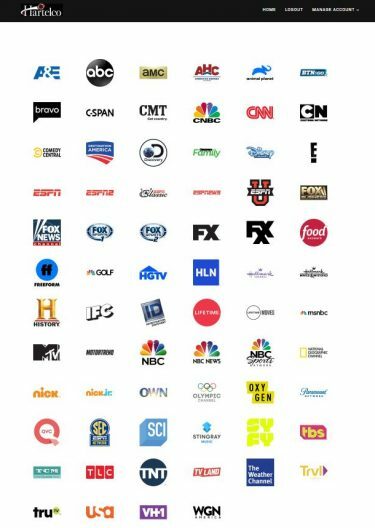 Several TV Networks are also now available on Apple TV, Roku, and XBox. However, some TV networks have not made their programs available on all devices. Visit your device’s app store and search by the network name for available applications. Once you are registered, you can watch any WatchTVEverywhere program as long as you are a subscriber to that network. For example, you must be an A&E subscriber to watch A&E’s WatchTVEverywhere programs.Different networks make different programs available at different times. Each TV network makes their own decision about what to make available on WatchTVEverywhere. Yes. We are working with many different program providers to expand the number of networks and the number of programs available. When logged in, you will see them automatically when they are added. Please note that watching WTVE on your PC, smartphone, or mobile device may cause you to incur mobile data charges! We strongly suggest using Wi-Fi to view WTVE! Hartelco is NOT responsible for any data charges that may be incurred.